I am a firm believer in signs and wonders. I constantly ask God for signs to guide me in His best direction. For example, when I was in college, I asked Him to give me signs if a certain man were to be my future husband. Without fail, He gave me signs, and that man is now my husband. One sign that I ask for in particular is a rainbow because it represents promise in the Bible. Specifically, it is God's promise to never flood the Earth again. 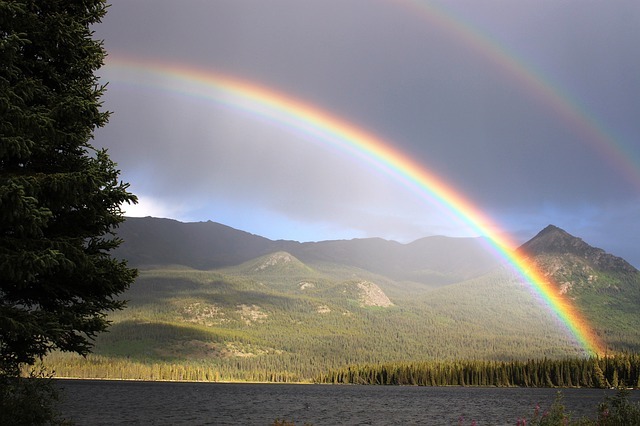 Now in current times, the rainbow has been hijacked and twisted to be the sign for other causes, but in the Bible the rainbow represents a promise of God, and God Will Never Break a Promise. For almost 2 years now, my husband and I have been trying to have a baby. I have had health issues in the past (despite being at a healthy weight and being physically fit), and I didn't know if we would be able to have children. We both desperately wanted children. At first, after a year of trying, we finally found out we were pregnant. But then, at almost 7 weeks, we had a devastating miscarriage. Everywhere I looked, I saw pregnant women, and I hated them. I was envious of their large bellies of new life. For every month after, we kept trying. The only thing that I wanted for my birthday, Christmas, Mother's day, was to get pregnant and have a baby, and I really want twins eventually. A few months after the miscarriage, I started to ask God for my sign of rainbows. And I got them...in abundance! To start off, one morning when I woke up, I wanted to listen to the song that my husband and I had walked into our wedding reception to "500 miles" by The Proclaimers. I didn't know anything about who sang it, only just that I liked the song. I started to research who sang it, and came to find out that it was twin boys. I didn't think too much about that right then. However, that same morning, I was at work when a woman, pregnant with twins, pointed out a "double" rainbow (see picture above). There have been a lot of odd occurrences like this, but fast forward a few months more. It was about a month before my birthday, when I was doing the grocery shopping for work. I was in the baking isle, and I looked up at the frosting. In the past, every year for my birthday, I've only wanted the rainbow chip frosting. However, last year just before my birthday, they had stopped making it and I was so upset that I never wanted another cake again. But on this day, when I looked up at the frosting, I saw that it was back on the shelf, after not being there for an entire year. I was ecstatic about it, but even more so because it seemed like a sign from God that I would get pregnant. There were two things that I wanted for my birthday: a baby and that rainbow chip frosting. I felt like this was a sign from God that I would get both. A week before my birthday, I decided to take a pregnancy test. I wasn't due for another 5 days, but I decided to check anyway. Within two minutes the test read "Pregnant," and I was stunned. I had been so used to seeing negative tests and had tried to remain optimistic, "Maybe next month". Still stunned, I showed my husband and he became excited too. The next morning I tested again, with the same result "Pregnant!" God answered by prayer! He gave me rainbows! Now, whether we are pregnant with twins or not will be determined in a few months. Thank you Jesus, for Your constant signs and patience You have given me. Please help me make the best choices for this child You've graciously let me take care of.